I have been a semi-professional musician for almost 10 years. I have also been writing music equally as long. 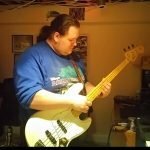 I love writing and recording music and trying new techniques for guitar and bass. As I learn new things I want to share them with you guys. I encourage going beyond the class room and learning from those you are fans of. Together we will work to create a generation of awesome musicians.